President Erdoğan of Turkey seems to be backpedalling a bit on his remarks about sending Australian tourists back in coffins, just like in 1915. 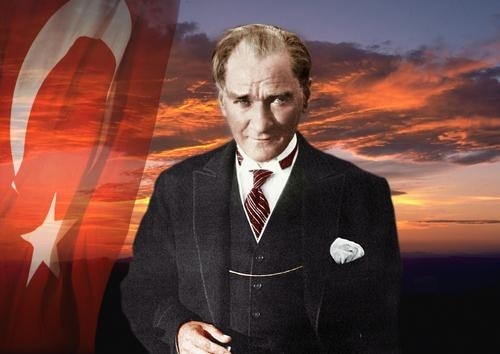 Earlier, Prime Minister Morrison quoted Mustafa Kemal Atatürk’s alleged words about Australian-Turkish unity in death, implying that Erdoğan had betrayed these sentiments. Actually, Erdoğan is no great fan of the secularist Atatürk and has been doing his darnedest for some years to whip up Islamist sentiment, particularly among his rural base, who are now quite used to being told that the Ottomans in 1915 were engaged in a jihad to drive out the Christian invaders. There is material on this from Fairfax journalist, Ruth Pollard, and Turkish academic, Ayhan Aktar, and we recently saw (and shortly will post a review of) a Turkish documentary which has some fascinating material taken from the comments of Turkish youths in the visitor’s book at Lone Pine. Gallipoli. They sound rather like President Erdoğan. Rather than provide links to current sallies – they are easy enough to find in the mainstream media – we decided just to remind people that there is no strong evidence that Atatürk ever said or wrote the words attributed to him and commencing ‘Those heroes that shed their blood …’. On the other hand, there is strong evidence that the words were cooked up long after Atatürk’s death and promoted by Turkish politicians and diplomats for their own purposes – helped by some gullible Australians. The most famous phrase in the famous words – that there was no difference between the Johnnies and Mehmets – was invented by an old Digger in Brisbane in 1978. ‘Warm and friendly’ might not cut it – for a while at least. But here below to go on with is a nice, rather romanticised picture of Atatürk. 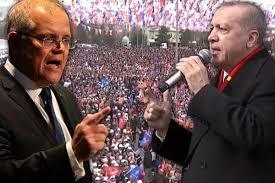 And a montage of President Erdoğan and Prime Minister Morrison making similar gestures. Meanwhile, Minister Chester has advised us about travel arrangements for the Anzac season.